A few weeks ago I wrote about how I missed a cake I had in Perugia, Central Italy. Francesca then kindly told me the name of the cake - torcolo, the traditional cake in Perugia for the feast of one of the patron saints of the city. She also sent me a link for its recipe (thank you so much Francesca!). I just love these local favorites, they really add more personality to the places, or at least give me an anchor to talk about them. Like, when I tell people I'm from Hongkong, they'll gasp "ooooh, dim sum!". Many times I told taxi drivers in Singapore to take me to Joo Chiat, they'd immediately put their thumbs up to 'the best wanton noodle and chilli crabs'. Any specialty in your area then :) The recipe in the above calls for cocoa, I've skipped it and re-adjusted the balance between dry and wet ingredients. And since I like cakes nutty and rustic, a couple of new ingredients were added. 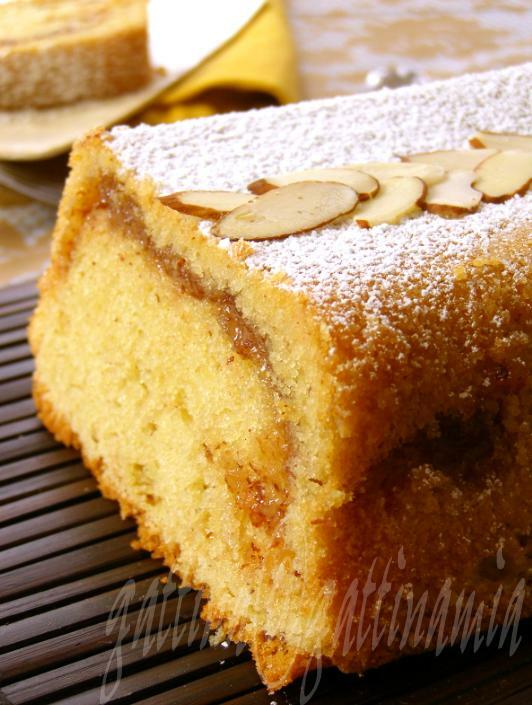 Although this almond cake isn't the original torcolo, I still find the result very satisfactory. Beat the butter and sugar until light and fluffy, add yolks, one at a time, mix to coperate. In a large mixing bowl, combine flour, ground nuts, lievito and salt. Scoop in 1/3 of the butter mixture, and some milk, mix well; then another 1/3, and milk, mix well; then the last 1/3, and milk, mix to combine. Grease a 9x5" loaf pan, pour in half of the batter, spread the almond filling, then pour in the rest of batter. Bake in a pre-heat oven 335F about 40 minutes. What a succulent cake !! 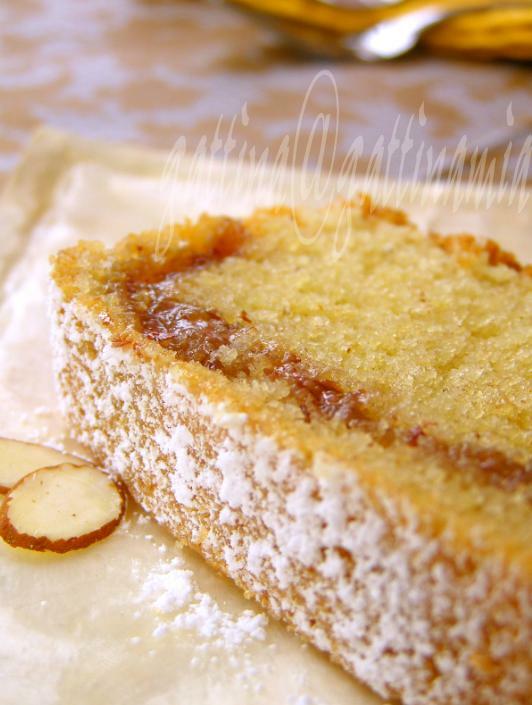 I loved the look of that almond filling in the cake. Lovely photos too. Such a moist and buttery loaf. Do you think I can substitute the special leavening agent and almond filling with something else? i know exacty what u mean by local favourites. do u associate those places with those food memories? that is an awesome looking cake.have to try it.waiting for the weekend. Oh gosh! this looks yummilious, I wish I can have a piece. yup very succulent. looks very moist and delish :) thx for sharing the recipe lady! Archana, thanks! I think the almond filling also perks up the flavor, very nice indeed. Angie, I think you can tell this cake formulated like a pound cake's. With your scientific knowledge (compliement! ), I'm sure you can estimate the amount of baking powder (sub of leavening agent). And add a dash of vinalla extract. For almond filling, you can skip it, but I personally love it. It's made of ground almond and corn syrup. Littlehands, thanks for visiting again. I wish I could visit your blog too, but seems the link is broken. Gattina, thanks for your kind words, you put too tall a hat on me. I was thinking of replacing the almond filling with a streusel-type filling, will keep your advice in mind, thanks. I'm just getting ready to have a cup of coffee and I would love to have a slice of that with it! It looks fabulous! I love almond filling. such a yummy looking cake with a wonderful presentation and beautiful snaps. with my new found love for quick cakes and breads, this is going on my favorites list to try...thank you for the recipe...and the cake looks beautiful! Gattina, I'm sorry for the broken link. I tried but just couldn't create the link, so I emailed Blogger Help for assistance. The reply I got from them didn't solve the problem either. Oh, they also asked me to check with other bloggers but I paiseh lah.